The United Nations called on Japan to enact legislation to "firmly address" growing incidents of hate speech against ethnic Koreans and other minorities. The Committee on the Elimination of Racial Discrimination issued its concluding observations on Aug. 29. The panel also urged Japan to conduct an investigation and apologize to "comfort women" who were forced to provide sexual services to wartime Japanese military personnel. The concluding observations were the third set issued to Japan since it joined the International Convention on the Elimination of All Forms of Racial Discrimination in 1995. Although the document is not legally binding, it does contain about 30 items that the panel felt the Japanese government should work on, including discrimination against foreign workers. In response to recent demonstrations targeting ethnic Koreans in Tokyo and Osaka, the panel for the first time dealt with the issue of hate speech incidents in Japan. The panel called on Japan to "firmly address manifestations of hate and racism as well as incitement to racist violence and hatred during rallies." Japan has no legislation prohibiting hate speech, nor legal definition in the Western sense of what constitutes hate speech. In addition, the panel expressed concern about the spread of hate speech through the Internet and other forms of social networking. It called on Japan to "take appropriate steps to combat hate speech in media, including the Internet." The panel also called on the government to "pursue appropriate sanctions against public officials and politicians who disseminate hate speech." It recommended the passage of legislation to restrict hate speech, as well as a specific law to prohibit all forms of racial discrimination. In July, the U.N. Human Rights Committee released its own report calling on the government to ban hate speech. The latest report by the Committee on the Elimination of Racial Discrimination also covered the comfort women issue and called on Japan to "conclude investigations on violations of the rights of comfort women by the Japanese military" and to "pursue a comprehensive, impartial and lasting resolution" of the issue through "sincere apology and the provision of adequate reparation." The panel also called on the government to "condemn any attempts at defamation or denial" of the issue. AJW Forum Welcome to our new community of thoughtful contributors on the state of East Asian affairs. The ruling Liberal Democratic Party rejected the idea of using “hate speech” regulations to silence anti-nuclear protesters after the suggestion sparked befuddlement and anger among opposition politicians and citizens. 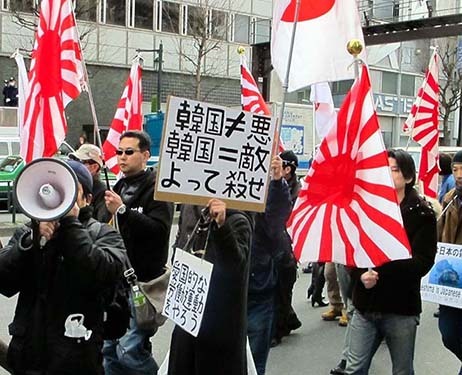 The United Nations panel that called on Japan to crack down on hate speech rallies targeting ethnic Koreans focused on demonstrations held mostly in Tokyo and Osaka. A project team of the ruling Liberal Democratic Party met for the first time on Aug. 28 to discuss measures to deal with hate speech demonstrations in Japan. SEOUL--China is trying to drag South Korea into its camp to challenge Japan on differences over historical perceptions, including the wartime "comfort women" issue.